Fresh green beans simmered in chicken stock until perfectly soft and tender, spiced with Saigon cinnamon and finished with a blanket of tomato . . . it sounds strange, but really it is such a satisfying combination. The warmth of the cinnamon and the rich, creaminess (yes, creaminess) of the tomato paste compliment the green beans perfectly. This is another recipe I inherited when I received my grandmother's recipe box after she passed away. 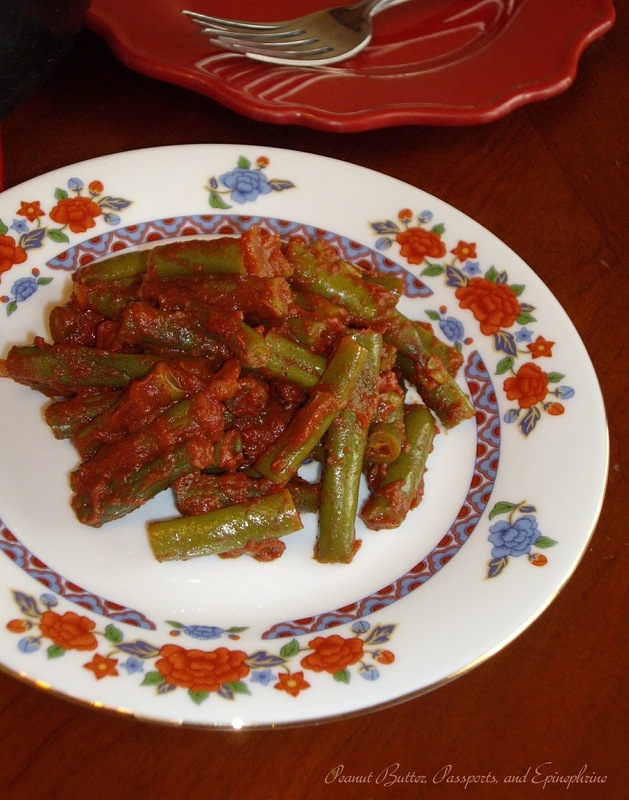 We had these often growing up; they were our traditional Thanksgiving green bean dish. I've had variations of it throughout the years, but when I found this recipe, and made it the way she instructs, I was overwhelmed by memories. This is a dish we prepared on our latest trip. I was planning on telling you about it in that post but due to the oven fire and zucchini pandemonium which I told you about on Facebook, that post won't be out for a few more days. You, however, shouldn't have to wait to try these amazing beans. Especially since good green beans are in season now and are so plentiful. If you're freezing your beans, this works just as well with them, too, in the cold, dead of winter. In a large sauce pan with a tight fitting lid, cook the onions with the cinnamon in the butter until soft but not brown. Add the beans, chicken stock, and a pinch of salt and pepper. Cover tightly and simmer for 20 - 25 minutes or until the beans are perfectly tender. Gently stir in the tomato paste and cook 3 - 4 minutes longer. Serve hot. I've never heard of Saigon cinnamon, Mexican cinnamon, but not Saigon. Now I'm curious as to how it taste. Love the idea of adding a little tomato and cinnamon to green beans. What a unique and tasty looking dish! From what I've read, cinnamon purests don't consider it to be the "true" cinnamon. I, however, happen to really like it. The flavour is warmer and more spicy than ceylon cinnamon - like red hots as opposed to apple pie.